Fungal infections are often a sign of immune deficiency, overuse of antibiotics or lack of hygiene. The most common fungal infections are caused by candida species, especially Candida albicans. Fungi, including yeast varieties, prefer warm, moist areas of the body, such as the genitalia, underarms and feet. Localized fungal infections can spread to become systemic, which is life threatening. Antifungal drugs are generally effective, although they often cause liver and gastrointestinal irritation. Some natural herbs display antifungal properties without negative side effects. Consult your doctor before treating any condition with herbs. Garlic was viewed by the ancient Greeks as a general health tonic because of its powerful antimicrobial properties. 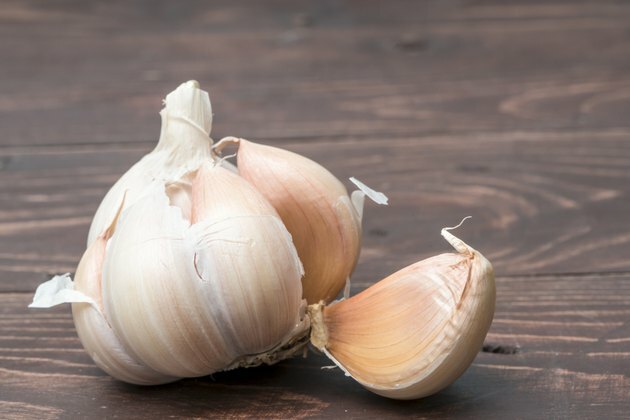 Most fungal infections, including candida, can be eliminated by raw garlic, which is both plentiful and affordable. The antifungal properties of garlic are most related to the chemical allicin, which destroys fungus while safeguarding the beneficial bacteria of the intestines, according to "Biochemistry of Human Nutrition." Garlic can be rubbed on external fungal infections, eaten raw or consumed as odor-free capsules. Coconut oil is also a strong antifungal agent and a stimulator of the bowels, which is important to flush out unwanted microbes from the body. The main medicinal components of coconut oil are lauric acid and caprylic acid, both fatty acids that prevent fungal and yeast overgrowth by attacking them directly, according to "Nutritional Sciences." Coconut oil can be taken orally, used on the skin or as part of a vaginal douche, depending on the site of infection. Coconut oil also acts as an excellent skin moisturizer. Tea tree oil has been used in Asia for generations as a general disinfectant, both internally and externally. According to "Chinese Herbal Medicine: Materia Medica," tea tree oil is an excellent full-spectrum antimicrobial, which is an agent that deters or kills bacteria, viruses and fungi. Tea tree oil can be especially effective against vaginal infections because fungal and bacterial species sometimes overgrow simultaneously. Tea tree oil is best used vaginally by soaking tampons with it or adding it to a douche. It also is a good choice for fungal infections of the nail beds. Oil derived from oregano leaves is a very potent antimicrobial. It usually must be diluted prior to use, as it can produce intense stinging sensations. The medicinally active chemicals are carvarcol and thymol. Carvarcol is the stronger antifungal and effective at killing systemic candida infections as well as those of the skin and nails, as cited in "Chronic Candidiasis." Goldenseal root has also been used as a general disinfectant, especially to promote the healing of minor cuts and burns. With time, goldenseal proved it could work internally as both an antiviral and antifungal, although it is often employed to enhance the effects of other, more potent antimicrobials, according to "The Complete Book of Chinese Medicine." Goldenseal can be prepared as an ointment and applied directly to fungal infections or taken as a capsule. The olive tree was revered as a health source by the ancient Greeks, who used many components of it. Both olive oil and olive leaf extract contain the chemical oleuropein, which is a strong antifungal. Oleuropein doesn't kill fungi or yeast directly, rather it disrupts the reproductive cycles and is able to reduce populations quickly, according to "Medical Herbalism." Oleuropein also reduces and stabilizes blood sugars, which acts to starve yeast and fungal forms because they require sugar for food.